Adams, "Geoffrey Charlton" (1864-1939), born May 11, at Covington, Kentucky. His parents are listed in the 1910 U. S. Census as natives of Kentucky. However, very curiously in the 1930 Census they are listed as Scottish born in Scotland. This bogus genealogy continued where his father was Warren Adams and his mother was a McGregor also from Scotland listed on his funeral home death certificate with the information supplied by his third wife Marion J. Adams who survived him. However, we know that is false. He married his third wife Marion J. Adams in 1915, which is when he began telling his third wife he was Scottish descent. Maybe she was Scottish and he was trying to impress her. We give you this up front since he is one of the most enigmatic, difficult and elusive numismatic biographies ever to trace out. Adams claimed to be a numismatist since 1879. The only records known that can place him as a numismatist in the 19th century are those found in the Lupia Numismatic Library, Special Collection, the Chapman Family Correspondence Archive. On February 26, 1894, he was married to Henrietta "Ettie" Wing Dorr of Buffalo, New York, at Church St. John the Evangelist, Boston, Massachusetts. So we know he was always on the go as a traveling salesman of some sort. Regardless, the marriage was brief for he marries a second time four years later. Fig. 1. Postal Card sent by G. C. "Geoffrey Charlton" Adams to the Chapman Brothers postmarked Saint Louis, Missouri, November 21, 1895 at 1 P.M. 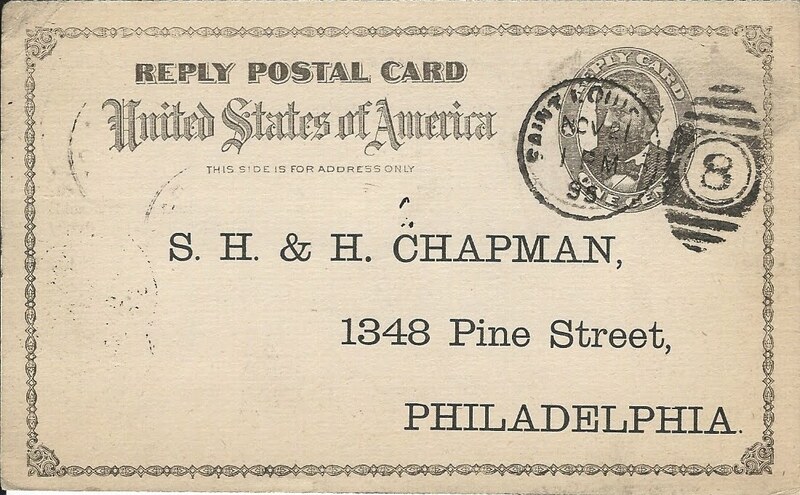 This is very possibly the Chapman reply card mailed with their circular about the Richard Boswell Winsor sale held on December 16-17, 1895 that was mailed to Frank Elmer Ellis the owner of St. Louis Stamp and Coin at Saint Louis, Missouri. If so Ellis gave the card to Adams to solicit a copy of the Winsor catalogue as a courtesy to a customer. Courtesy, Lupia Numismatic Library, Special Collection, the Chapman Family Correspondence Archive. Fig. 2. 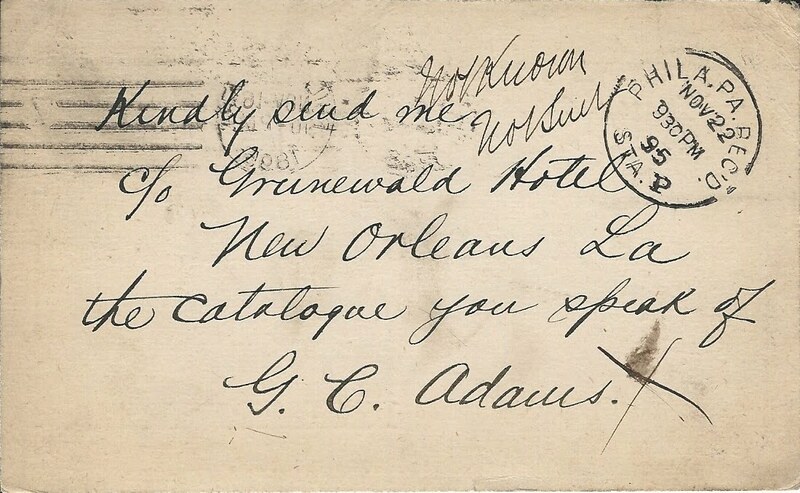 Verso of the Postal card "Kindly send me c/o Grunewald Hotel, New Orleans, La., the catalogue you speak of. G. C. Adams." The Chapmans annotated: "Not known Not sent" Apparently Adams was not entered in their clientele list betraying the fact that the reply card was given to him by one of their clients in St. Louis. Since the card was postmarked "Saint Louis, MO" and the request to send a catalogue to New Orleans, Louisiana must have sounded suspect to the penny-pinching Chapmans who were far to reticent to send off a catalogue at their expense with no guarantee of a return. There are currently 17 pieces of correspondence from Geoffrey Charlton Adams catalogued in the Lupia Numismatic Library. When the digital catalogue is completed 1909 to 1939 the updated total report shall be posted and a few photographs as well. The Grunewald Hotel was a newly built hotel in 1893 by Louis Grunewald (later renamed the Roosevelt Hotel). Adams was apparently a traveling salesman or traveling engineer consultant as he avers in his publications. As John Weston Adams (no relation) points out Geoffrey Charlton Adams emerged as a coin dealer out of the blue in 1903. At that time he resided at Creston Avenue, Bedford Park, New York City, New York, and later kept an office in 1905 at 608 Flat Iron Building, New York City, New York Coin. He was not only a coin dealer but in 1905 the owner-editor of The Coin Cabinet, and publisher of thirty coin auction catalogs from May 1903 to October 1906 as a numismatic cataloguer and auctioneer. He was also a book auctioneer of both numismatic literature and rare books. (New York, 1903-1906). In January 1904 he advertised a book auction in the New York Times. He is well-noted for his September 2, 1904 paper delivered to the Chicago Numismatic Society with his critique of the 1804 Silver Dollar as a later restrike based on his opinion as an engineer that these coins were all later struck with a steam press engine between 1836 to 1860 and postulating they all date to the latter. Early in 1906 he donated numismatic literature to the ANS Library. At the March 15th, 1906 meeting of the Royal Numismatic Society, London, which he attended, he was elected a Fellow member to the RNS. Farran Zerbe wrote a complimentary piece about Adams in The Numismatist, August, (1906) : 272. The Numismatist, October 1906 issue, page 344 lists him as expelled from the ANA. There is no record held by the ANA explaining why Adams was expelled. In the June–July 1907 issue, The Elder Monthly, reprints an obviously fictitious and vituperative letter from “A Reader,” titled “Where is Geoffrey” and reading in part: “Have any of your readers seen or heard of Geoffrey ‘Charlatan’ [Charlton Adams], member R.N.S., etc., etc., etc.? he who formerly held a ‘suite’ in the famous ‘Scrapiron." The accusation of his being a Charlatan, i.e., an impostor suggests he used either a fictitious name or assumed the identity of someone else. A decade later Thomas Lindsay Elder capitalized on this silent mystery making acid comments about him in one of his catalogues implying he either absconded with several collectors coins or their money. Was Elder telling the truth or just being Elder the infamous rival of Farran Zerbe? At the October 1909 meeting of the Royal Numismatic Society, London, he was removed as a member for non payment of dues having been in arrears for two years. In 1910 he resided in Riverside, Bergen County, New Jersey, with his second wife and in-laws Walter F. and Anna Macy, married to their daughter Letitia (1874-1968). That 1910 Census says they were married for 12 years making the wedding take place in 1898. He is listed as an engineer but accordingly never attended school. Hence contradictions about him abound. In 1915 he married Marion J. Adams (1895-). In 1930 he was in New Orleans, Louisiana working as a Civil Engineer Consultant. He and his wife Marion moved to San Francisco, California in 1933, residing at 2360 Mission Street. On May 23, 1939 he died in San Francisco Hospital, San Francisco, California. Adams was a member of the Nantucket Historical Society and Royal Numismatic Society while married to his second wife. March 31, 1905, Catalogue of the Collections of Coins, Medals, Autographs, Books, etc., The Properties of M. H. Stafford. Messrs., Mix, Gibson, Cramer and the Late Geo. W. Rode. Sold at Auction on March 31, 1905 by Geoffrey Charleton Adams. November 13-14, 1906 Dixie Land Collection beautiful plates. Only known example Kolbe & Fanning sale January 12, 2013. Discovered in September 2012. Special thanks to Henry Lythe, Administrator, Royal Numismatic Society, London for his very kind assistance. Also, to Christine Robitaille and Kay Olson Freeman for their contributions in genealogical research. New York Times, Friday, July 13, 1906, Chinese coin auction at the Bartholdi Hotel. John W. Adams, United States Numismatic Literature, Vol. 11 : 50ff. Remy Bourne, American Numismatic Periodicals 1860-1960 (1990) Vol. 1, 1900-19 to 1900-20.